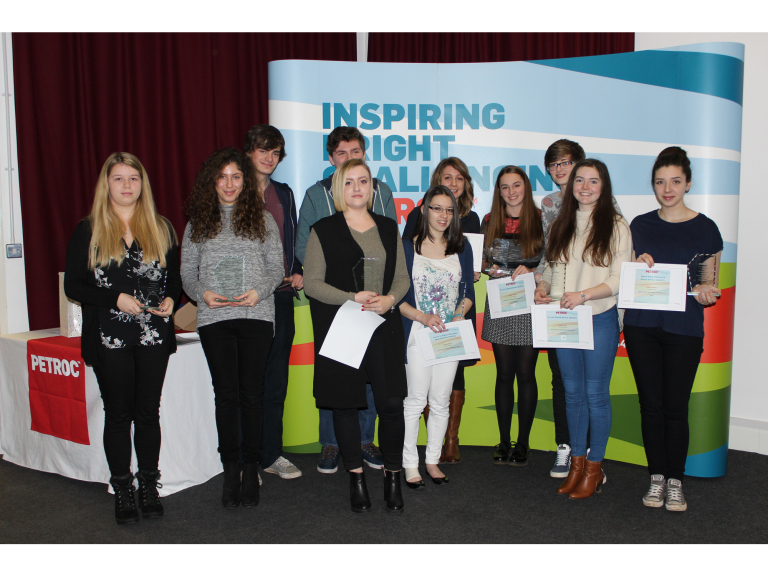 The event was held at the Mid Devon Campus and winners from the class of 2015 were presented prizes for outstanding academic and personal achievement. The returning students, who have gone on to university or employment, were reunited with each other, as well as their college lecturers who gave glowing citations as the awards were handed out. Among the award winners were many former Tiverton High School students, and their awards were presented by the school’s Head Teacher, Andrew Lovett. Harry Wood, a former Tiverton High School pupil, was the top achiever at Petroc’s Mid Devon Campus in 2015, gaining an A* and two As at A Level. Harry is currently studying Maths at Bath University. Harry picked up the Overall Academic Achievement award, and a glowing citation was read by lecturer Lynda Broomhead: “Harry’s final grades speak for his academic quality but within those grades are some truly impressive scores; on four of the six maths units that formed part of his A2 Mathematics qualifications Harry achieved 100/100. “Harry has all the attributes to successfully undertake an undergraduate maths course and has the intellect to grace any institution and we have every confidence that Bath University are having the joy of experiencing this currently,” she added. Chloe Harper, another former High School pupil who is currently studying Textiles and Surface Design at Somerset College, was presented the award for the Diploma in Foundation Arts and Science. Speaking after collecting her award, she said: “I was overwhelmed when I found out I’d been nominated for an award. It’s lovely to have all that hard work recognised. “I really enjoyed my time at Petroc, and the support from all my tutors was fantastic. I’ve kept in touch with my lecturer and have already arranged to come back and deliver a workshop to current students later this year,” added Chloe.